Starting today, people in the US can purchase items directly on Instagram’s app from over 20 different brands, including Zara, H&M, Outdoor Voices, and Uniqlo. 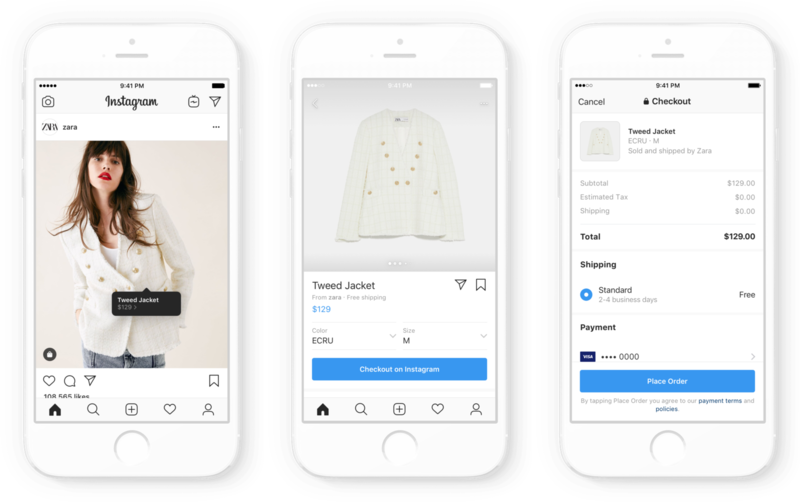 Now, for brands that are a part of Instagram’s initial invite-only beta test, you’ll be able to tap a product tag on a post and then buy the item within the app. Previously, tapping on a product tag directed users to an external website. Here’s how it works: After clicking on a product tag from a brand partnering with Instagram, you’ll see an option to “Checkout on Instagram” and you’ll be able to select a color and size, if applicable. Then, you’ll enter an email address, delivery information, and input credit card details or link a PayPal account, which Instagram will save for future orders. If you want, you can add a PIN for purchases to make your Instagram account more secure. Instagram is charging the brands a selling fee (which it won’t disclose) to cover services such as its purchase protection policy. That means if something you order through the app is damaged in transit, or is different than as described, and the merchant won’t refund you, Instagram will issue a refund for the full purchase price and shipping costs. The feature could potentially boost sales for smaller, independent brands or sellers in other marketplaces, like Etsy, who have protested increased transaction fees on the marketplaces where they sell. However, for now, Instagram checkout is aimed at larger, more established companies. Instagram has become increasingly important to the bottom line of its parent company Facebook. Some analysts expect Instagram to drive the majority of Facebook’s ad revenue growth by 2020. The move to develop a robust shopping experience signals the social network’s interest in cashing in on purchases inspired by its content, but transacted elsewhere. Instagram has long been a sort of shopping bazaar for vintage pieces and other items of carefully curated clothing. The way the informal marketplace worked historically was low tech: Users could “claim” items by commenting on a post with their PayPal-linked email first, or they could purchase the items through a link in the account’s bio. Since then, Instagram has become a critical marketing tool for online-only, direct-to-consumer products, ranging from makeup to mattresses — and more people are buying from these brands. A recent RetailDive study found that 81% of Americans said that they’ll make at least one purchase from a direct-to-consumer company in the next five years. The activewear outfitter Outdoor Voices, one of Instagram’s first checkout partners, is one such brand that makes the majority of its sales online. This new checkout feature is just Instagram’s latest effort to bring more shopping to the platform. Over the past year, the app has added shopping to stories, a channel dedicated to Shopping in the app’s explore tab, and a new profile view showcasing only products from shopping posts. And with the added ability to check out on Instagram, the company can now collect data on not just what you’re interested in, but what you actually spend your money on. The full list of brands launching with Instagram’s new checkout feature includes: Adidas, Anastasia Beverly Hills, Balmain, Burberry, ColourPop, Dior, Huda Beauty, H&M, KKW Beauty, MAC Cosmetics, Michael Kors, NARS, Nike, Oscar de la Renta, Outdoor Voices, Ouai Hair, Prada, Revolve, Uniqlo, Warby Parker, and Zara.